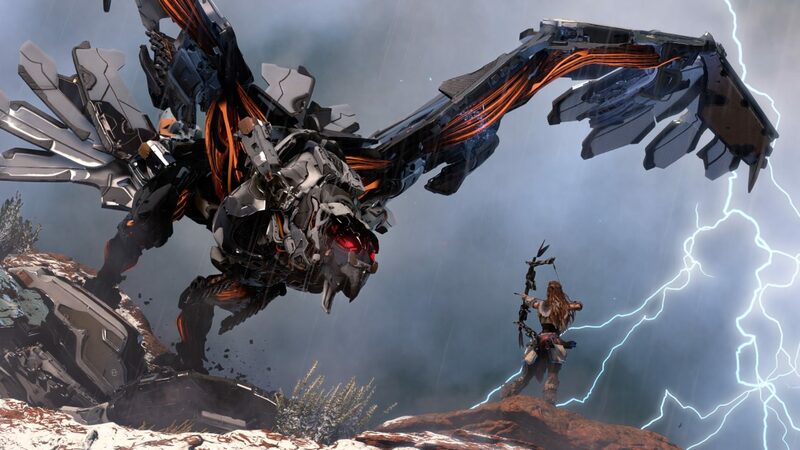 Guerrilla Games has kept the story of Horizon: Zero Dawn under close wraps so far, giving as few information as possible. To help shed a bit more light on that aspect of the game, which after all is a RPG, we talked with Senior Producer Mark Norris at Milano Games Week. 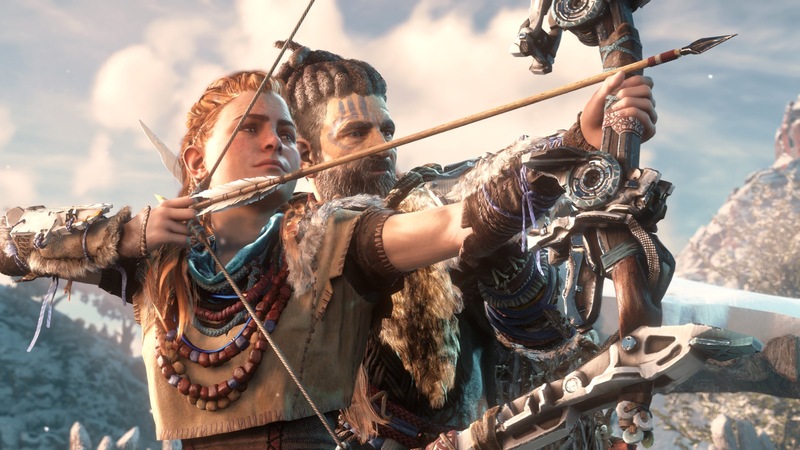 Norris talked about the mysterious and possibly evolving relationship between Aloy and the machines, the differences between the tribes between which humanity has splintered, the complexity of the story and the balance between maturity and accessibility. We also hear about the size of the biggest Machines (which I always just want to call Robo-Dinosaurs), the possibility of other ways of travel besides running and walking, and the composition and size of the development team. 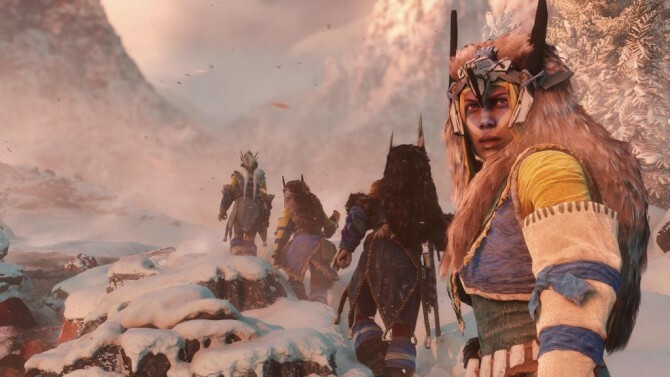 Norris even talked in more depth about the questions Aloy will ask of herself, and teases the fact that this game might open our mind to a different way in stories can be told in games. There surely is a lot to take in, so I leave you with the interview itself. Giuseppe: Can you tell me something about the relationship between humans and the dinosaurs… Ahem, the machines… I call them Dinosaurs because it’s cooler. Aloy almost seems not to treat them as enemies. 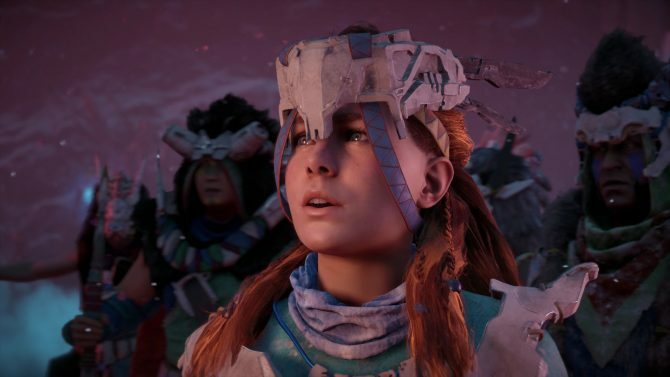 Aloy is an incredibly unique character, and she’s not actually representative of all of the rest of the different tribal humanity that you see in the E3 demo. She does have a little bit of a special relationship with the machines. We can’t really get into the details of what that relationship is, or how that relationship may exist, but thre is something about her. Something that’s happened sort of in the first nineteen years of her life, that really speaks to why she treats the machines the way that she does. And she may not always treat the machines the same way over the course of the game. So it is an interesting line, that has sparked a lot of interesting commentary, and we’re actually looking forward to see more people talk about what they think the theories are there. G: Do the other humans see the machines as enemies? MN: Without getting into story details, in a previous interviews at Gamescom I said specifically that marketing continues to try to get me to tell me more about the story… We don’t want to get into story details of the game. In fact, the story is actually one of the closely guarded secrets, because we think it’s really special. But in terms of what’s happening with the other… we call them tribes, and you hear that in the E3 video, they’re actually very distinct from one another. I think it would be a mistake to think about each of those tribes that they all think and act in a similar fashion. In fact, if you take a look at the E3 video, you can see that the first tribe is the tribe that Aloy comes from. And you can see that they’re kind of a nomadic kind of tribe. They have wooden homes, and they appear as if either they haven’t been there long, or they had to move around a lot. And that probably shapes their cultural influences and their relationship with the machines. Similarly, there’s the tribe that you can see on top of the giant plateau, with a really cool city sitting at the top. And of course, like Aloy mentions in the dialogue, some live like kings. Their relationship with the machines is actually very different. Perhaps the reason why those walls appear to be more stone and less wood is because they’re not threatened nearly as much. So each of these tribes has a different relationship, so I don’t think we can generalize kind of what Humanity’s relationship is with the machines, but I think it’s also a relationship that changes over the course of the game. G: So, is the story gonna be very complex? Can we expect plot twists, romance, intrigue and things like those? MN: I think you can expect that this is an incredibly rich story. It’s always interesting, that open world games ordinarily fall in one of two camps. We’ve got these really strong narrative-driven, character-driven open world games like The Witcher 3, or an Assassin’s Creed, or even a Watch_Dogs, where there’s a strong central character, and a bunch of story that revolves around the character. And then you’ve got these other open world games, on the other side of the spectrum, previous to Fallout 4, I would have said a Fallout 3 or a Skyrim, where the story is really the story of the world, and it’s less the story of this main character. Our game, actually, it has both. The main story revolves around Aloy. She’s one of the reasons why we’re a single player only game. We want to tell the story of Aloy. But we also want to tell the story of the machines, the story of the world, the story of these tribes, and you’ll get those inside of quests, in open world activities, collectibles and other things. G: How mature is the story going to be? Are you aiming for a specific rating or going with the flow and what comes comes? MN: It’s actually a super interesting question, and this gets into producer versus creator, some times, sort of fights. The creative on the story wants to make a story that’s incredibly mature, incredibly sophisticated, and incredibly deep. And of course the Producer side of me says, you gotta make a story that’s accessible. I need to sell a certain number of units on the game, and I need to think how I’m gonna get bonuses for the people that worked incredibly hard on the game, and writer, you want a bonus too, I know you do! So we need to strike a balance, between telling a story that is rich, immersive and very deep, with a story that does have a level of accessibility, but I think we’re gonna find that point. I think right now we’re balancing it. G: The world seems really, really big. Of course I’m not going to ask you the usual question of how big it’s gonna be. G: I know you’re not gonna tell me, anyway. MN: (Laughs) Smart. This guy’s been doing this for a while. MN: Smart journalist asks smart question to try to get me to answer a question that really says how big the world is, right? (Laughs) The reality is, a certain size of the world I think demands a mount, right? We take a look at a world like The Witcher, which is an enormous world, we take a look at a world like Skyrim, which is 41 square kilometers, and they?ve added mounts. We take a look at GTA or Saints Row, those are games that have cars, right? So they have ?mounts.? 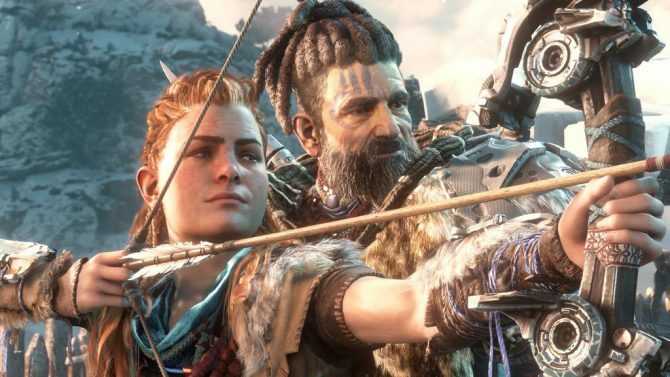 We?re not ready to talk about the different ways that Aloy moves around the world, but what I can guarantee is, it?s not just walking and running. Certainly, she gets around the world in a couple of different ways. G: I’ve seen you guys hired quite a few people for this game. G: Exactly. I’ve also seen people from CD Projekt, others from the Fallout team. What kind of percentage of the team is made by Killzone veterans, and how many are new blood? How big is the team working on Horizon? MN: Without getting into specific numbers, the team working on Horizon is more than 150 people. The bulk of the team did transition over from Shadow Fall sort of in late 2013, early 2014. Before then it was actually a very small team. In terms of the percentage of new faces versus the old Shadow Fall crowd, it’s still very heavily old Shadow Fall crowd. I think one of the things about bringing guys like me who worked on League of Legends or Dead Rising previously, is that the media likes to report about some of the senior guys that come in, so you bring in a David Ford from Bethesda. or you bring in a John Gonzalez who did Fallout: New Vegas and Shadow of Mordor, but the reality is that when we look at the leadership positions, the majority of the people are still people who worked on Killzone. And in reality the directors group on the project is still Mathijs de Jonge, who is the Game Director, he was the Game Director for Killzone 2, 3 and Mercenary. And the Art Dirctor is Jan-Bart van Beek and the Lead Producer is Lambert Wolterbeek Muller, so we have a really nice mixture of the old Shadow Fall/Killzone crowd and the newer crowd of guys that have come in who have open world experience. But most of the people working underneath that leadership group are mostly Shadow Fall/Killzone developers. G: Do you have a message from our readers that are eagerly awaiting for the game? What can we expect? MN: I think the biggest thing you can expect is that Horizon is ultimately a game about exploration. Fifteen-sixteen century explorers, they were amazing. They asked questions of themselves, they asked questions like “What is my purpose in the world?” and “Who am I?” Aloy will ask these questions of herself when you play this game. She will discover who she is. She will discover her purpose in the world. She will discover the weak points of the machines. She will discover all these different tribes around the world. She will discover people that will become very important to her over the course of the game. So I think you can get excited about discovering Horizon, because I think it’s gonna open your mind to a different way that we can tell stories in games. 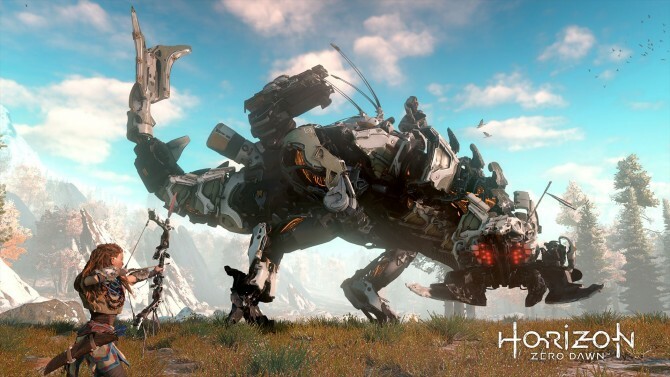 Horizon: Zero Dawn will come in 2016 exclusively for PS4.